The plantain plant is also known as Plantago lanceolata or Plantago major (not to be confused with the banana-like vegetable that is commonly eaten in many Hispanic cultures). It is a perennial plant with almost worldwide distribution. For decades, it has been considered by herbalists to be a useful remedy for a cough, wounds, inflamed skin, and dermatitis. Bruised or crushed plantain leaves are applied topically to treat insect bites and stings, eczema, and small wounds or cuts. The leaves and seeds are used to extract the beneficial compounds of this plant. There are nearly 250 species of plantain. In addition to Plantago lanceolata or Plantago major (the most widely distributed species), psyllium is a soluble fiber derived from the seeds of Plantago ovata, an herb mainly grown in India. Psyllium, the main ingredient in Metamucil, is used to treat constipation. Animal studies have suggested that Plantago lanceolata extract may aid in wound healing potentially due to its anti-inflammatory, anti-bacterial, anti-fungal, anti-oxidant, and anti-ulcerative properties. It may also act as a pain reliever (analgesic agent), as well as exhibit immunomodulatory properties (relating to the immune system). The most important components of Plantago lanceolata leaves are bioactive compounds such as catalpol, aucubin, and acteoside. These compounds possess different pharmacological effects: anti-inflammatory, antioxidant, antineoplastic, and hepatoprotective. In a study published in the journal Biotech and Histochemistry, researchers examined 72 wounded mice and applied an ointment that contained a specific percentage of Plantago lanceolata extract (PLE)—this was compared to ointment containing vaseline. They found that different concentrations of PLE exhibited positive effects on wound healing. Specifically, application of 10 percent PLE ointment may be a useful strategy for wound healing, but more research is needed. In addition, researchers examined two of the most commonly used plants found in the Balkans, which are Plantago lanceolata and Plantago major (P. major). When examining their use, researchers found that the traditional use of plants in wound healing is confirmed. Previous studies have indicated a variety of pharmacological effects of P. major such as anticancer, antioxidant, and immunomodulatory. In one study, researches tested this theory by extracting parts of the plant and testing it against different types of cancer cells. In this study, the roots inhibited the inflammatory cytokines comparatively to the leaves and petioles. Researchers concluded that the seeds of the plant exhibit the most anticancer and anti-inflammatory properties. 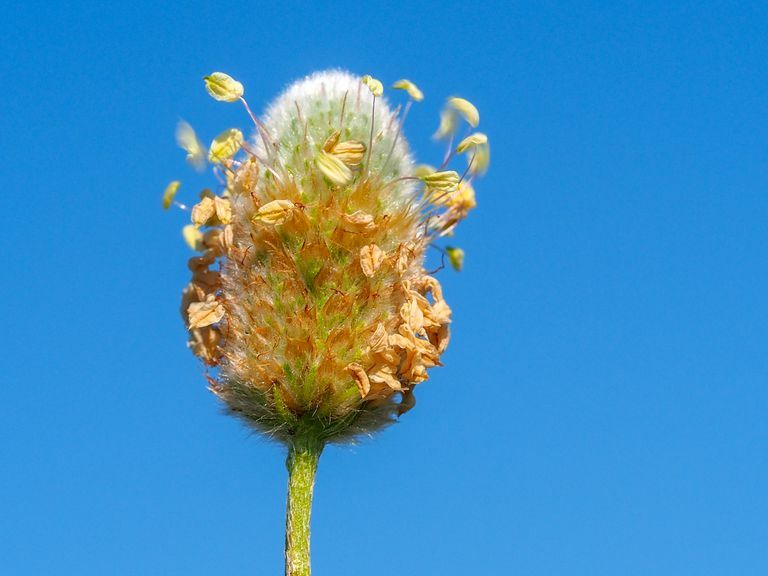 In a study conducted in the European Journal of Oncology Nursing, researchers tested the efficacy of using Plantago major extract (PME) in the treatment of mucositis (a common oral side effect present in patients undergoing chemotherapy and radiation). They concluded that compared to double sodium bicarbonate solution, the healing time took longer, but the differences were not significant. Some manufacturers claim that these two types of plantain aid in "cleansing and detoxifying" the body as well as promoting respiratory health. Note, there is no research to date to justify these claims and that this is not a statement approved by the FDA. Psyllium, which is derived from the seeds of Plantago ovato, is used as a dietary supplement and is usually found in the form of husk, granules, capsules, or powder. You can also see psyllium as an added ingredient in cereals and baked goods. Psyllium husk is the main active ingredient in Metamucil, a fiber supplement often used to reduce constipation. Studies have found that psyllium, which is rich in fiber, helps to bulk stools while also increasing the amount of water in the stool. Psyllium a good remedy for constipation as it makes the stool easier to pass. In addition, studies suggest that fiber supplementation such as psyllium may help to reduce after-meal blood sugar—psyllium is a rich fiber source that increases the amount of time it takes to metabolize carbohydrates, thus slowing down how quickly blood sugars rise. Lastly, studies suggest that increasing fiber in your diet such as psyllium can help to reduce cholesterol levels and reduce the risk of heart disease. Psyllium is able to bind to fat and bile acids, which promotes the excretion of these substances from your body. A study examining adolescent males found that dietary supplementation with 6 grams per day of psyllium over six weeks improves fat distribution and lipid profile (parameters of the metabolic syndrome). According to the American Botanical Council, there are no known side effects of taking plantain as well as no contraindications. However, some people report experiencing diarrhea and low blood pressure when ingesting plantain. If you are someone who has allergies such as skin allergies or food allergies (to melon or the vegetable plantain), you may be allergic to plantain, too. In addition, if you are pregnant or breastfeeding, using herbal supplements may not be prudent. There isn't enough information on herbal supplement safety and, therefore, it's probably safer to simply avoid completely when pregnant or breastfeeding. It has been suggested that if you are taking Warfarin (Coumadin), a blood thinner, then you should avoid plantain use because it contains vitamin K. People who are taking warfarin or any other type of blood thinner need to take consistent amounts of vitamin K to reduce the risk of changing the effectiveness of their medication. Gas or stomach cramping may occur when ingesting psyllium. If these symptoms do not go away or if they get worse, be sure to contact your doctor or pharmacist as soon as possible. If psyllium is not taken with adequate amounts of water, it can cause constipation and possibly even cause choking, intestinal obstruction, or bezoar (indigestible material in your digestive tract). People who have a history of bowel dysfunction, such as obstruction or spasms, should not take psyllium supplements. Whenever supplementing with fiber, it's always a good idea to start slowing and gradually increase your dose. Companies such as Metamucil typically put instructions on their products to help consumers reduce side effects. Whenever you are unsure, ask your healthcare provider for help. It is difficult to cultivate a generic dosage considering the wide use of plantain. The amount and type of delivery will depend on what you are using it for. For example, the herb can be infused in tea, ingested in capsule form, in tincture form, rinsed, or gargled. Before beginning supplementation, it's important to speak with a medical professional. In addition, there is no reference to recommended dosing of capsule or tincture form of plantain; therefore, if you decide to use these types of delivery systems, be sure to consult with a medical professional. According to the Institute of Medicine, women who are 50 years old and under require 25 grams of fiber each day, and men 50 years old and under require 38 grams each day. Women 51 years or older require 21 grams per day, and men 51 and older require 30 grams per day. It's best to aim to get your daily fiber intake from foods first before supplementing with psyllium fiber. Fiber-rich foods include fruits, vegetables, whole grains, nuts, legumes, and seeds. Aim to make half of your plate contain vegetables at each meal, choose whole grains instead of white grains, and snack on fruit, nuts, and seeds on a daily basis. If you cannot reach your daily fiber needs with foods only, adding psyllium in some form can help you to achieve your daily needs. The way in which you should take it will vary based on the form of psyllium and the reason you are taking it. For example, if you are taking psyllium capsules for constipation, you may need to take multiple capsules multiple times per day. On the other hand, if you are taking psyllium powder, you may only need to use one scoop with water a few times per day. It is always suggested to start slowly and increase slowly to prevent side effects. If you are not sure how much to take, ask your physician or dietitian. When supplementing with psyllium, it's very important to drink adequate amounts of water. Failure to do so can actually have the reverse effect and cause constipation. Additionally, be mindful of when you take your medicines. Some companies recommend taking a fiber supplement at least two hours before you take your medications. According to the University of Michigan Medicine, adulteration (addition of another substance) of plantain with digitalis, another type of plant, has led to dangerous side effects reported in both Switzerland and the United States. Therefore, it's very important that consumers purchase herbs from companies that carefully test their herbal products for quality and adulteration. Because plantain extract in the form of Plantago lanceolata or Plantago major is not approved by the Food and Drug Administration (FDA), it's always a good idea to try to purchase brands that are tested by an accredited third party, such as the National Science Foundation (NSF), Certified for Sport, or United States Pharmacopeia (USP). Keep in mind that certification programs confirm that a product contains the ingredients listed on the label. They do not ensure a product’s effectiveness or safety. When possible, it's best to choose supplements that are organic, as this will certify that the plants have been grown organically without herbicides, pesticides, or other chemicals and increase the quality. When purchasing foods with added psyllium husk fiber, you may read claims such as, "Soluble fiber from psyllium seed husk may reduce the risk of coronary heart disease (CHD). This statement is approved by the FDA." The FDA has taken many precautions to make sure that these claims are stated accurately. This information has been derived from many clinical trials. Keep in mind that most subjects who benefited from increasing fiber in their diet also followed a lower fat, lower cholesterol diet. Why is it best to get fiber from dietary sources instead of using psyllium? Dietary sources of fiber are always recommended as a primary means of achieving your daily fiber intake. In addition to fiber, fiber rich foods contain other beneficial properties, such as vitamins, minerals, protein, etc. And supplementing with psyllium incorrectly could cause potential side effects, (including constipation, choking, and more). However, if you do find you need to take psyllium to supplement your fiber intake, it's best to consult with your doctor to make sure you are taking it as intended. There are many species of plantain, the most commonly used extracts come from Plantago lanceolata, Plantago major, and Plantago ovata. Keep in mind, though, that some derivatives of plantain are not approved by the FDA and should be sought from reputable companies. It's always wise to consult with a physician before beginning any kind of supplement. Make sure to start slowly, increase gradually, and take any supplement (including psyllium) with adequate amounts of fluid. Kartini, et. al. Effects of Plantago major extracts and its chemical compounds on proliferation of cancer cells and cytokines production of lipopolysaccharide-activated THP-1 macrophages. Pharmacogn Mag. 2017 Jul-Sep; 13(51): 393–399. Michigan Medicine. University of Michigan. Plantain. Blumenthal M, Busse WR, Goldberg A, et al. (eds). The Complete German Commission E Monographs: Therapeutic Guide to Herbal Medicines. Austin: American Botanical Council and Boston: Integrative Medicine Communications, 1998, 186-7. Dow, S. et. al. Ultrahigh-viscosity hydroxypropylmethylcellulose blunts postprandial glucose after a breakfast meal in women. J Am Coll Nutr. 2012 Apr;31(2):94-9.